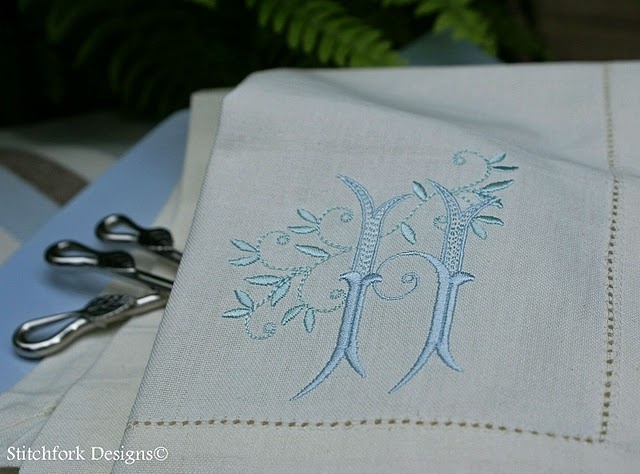 In my last blog, I did a foam and embossed design in Turquoise and mint green. The photo does not do the colors justice. During the week, I did have a question - What is the difference between 'embossing' and 'Trapunto'? They seem a lot alike to me! Well, my friend, Cathy Sundermann answered that - Embossing and Trapunto are two different techniques, although they can have a similar final look. 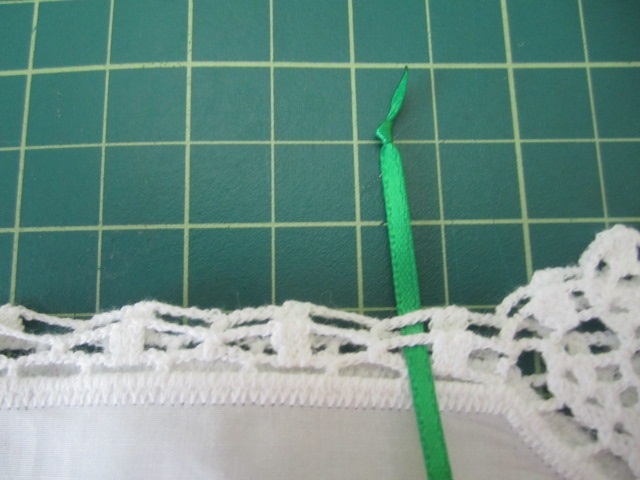 When embossing, you are stitching down the nap in some areas and leaving other areas unstitched to create the design. 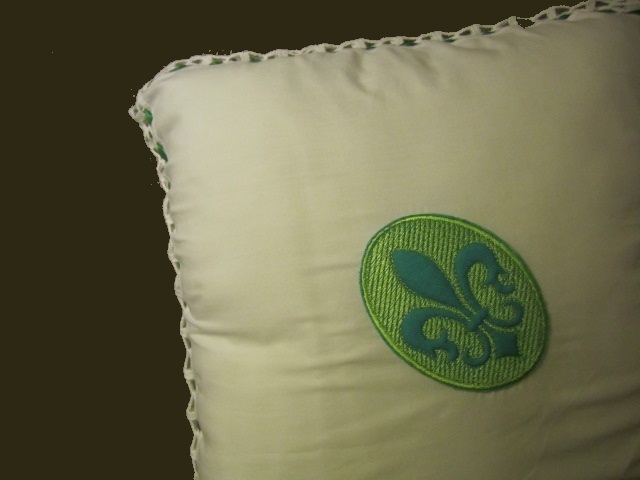 This only works well on textured high nap fabrics like terry cloth, fleece and some velvet fabrics. 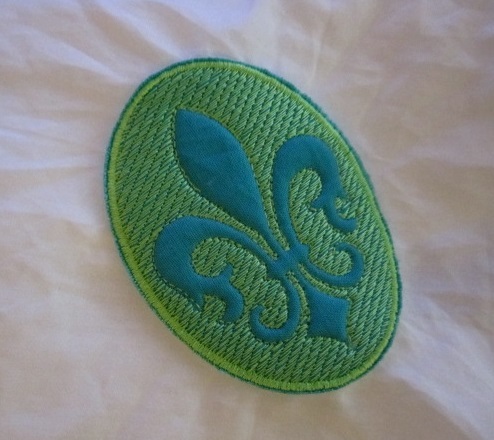 The Trapunto technique is more associated with quilting and you are embroidering on fabric that has padding under it, like quilt batting, to give it a plumped look. Cathy does digitizing by request and embroiders just like you and I - however, when I saw this, I decided that I have not been embroidering, I have been practicing. When I grow up, I want to do this type of work. . . . I have chosen my fabric for my no sew pillowcase from a hankie from the collection of All About Blanks. You may feel like you have seen this design before - and you have - likely you saw it in your grandmother's or a great-aunt's home. In the mid-century of the 1900's, circa 1950-1965, this was the crochet of the day. It was very popular, if you did not make it yourself, you got it as a gift. So I am using what I have and that can be VERY interesting. I am using the hankie with the pineapple/angle design, the turquoise foam, green thread, green ribbon (1/8"-3mm) and a 12" pillow insert. Unfortunately, the hankie is 11". In reviewing the various sites on the Net, I determined that it was advisable to use 13" of fabric if you are sewing, for a 12" pillow insert. Since I am not sewing, I should have used a 10" insert for the 11" hankie. 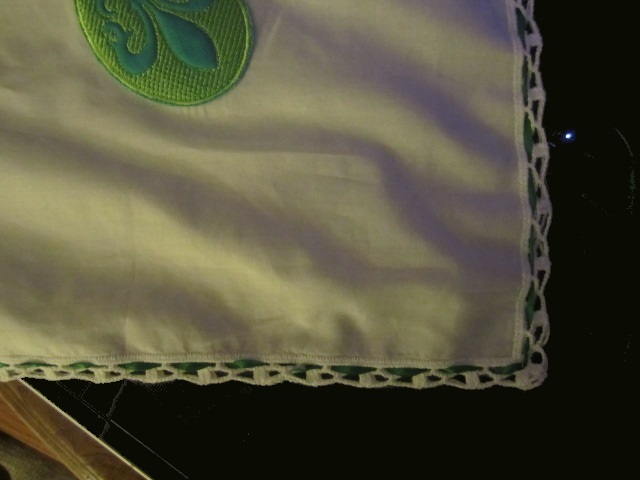 I am using part of that 11" lacing up the ribbon, so I do have a pillow insert that is too big. Well, I did say to always do a 'discovery sew'!!! I cut my ribbon at an angle, but you can cut it as you like it. Remember that you will just use a lighter or match and just barely touch that ribbon to seal it so it won't ravel. I made the knot so that I could weave it in and out of the lace. That is what makes this hankie work for this project. I have woven the ribbon around 3 edges. I left open the last edge for inserting the form. You can see my over-stuffed pillow. You cannot see the green ribbon and I won't be able to close the whole pillow. Isn't it fun to learn from my mistakes? Just the same, when I pick up a smaller insert, I will LOVE this one! It will be a 'shabby chic' with lots of personality. I cannot sew - it is true, I just don't have the ability to create something from sewing. That is why embroidery has so much fastination for me. From Eileen Roche, Editor of Designs in Machine Embroidery Magazine and her sister Marie Zinno, author of Machine Embroidery for Babies & Tots here is a zipper design that is used on your embroidery machine!!! Is that the coolest??? Zippers are the worst for me personally and I when I found this freebie from Eileen and Marie, I had to share it. There are two sizes, 7" and 9". That will cover so many of the projects that we all do. Additionally, at the same link are complete and easy to understand instructions. With this design, I figure a zipper should not take any more than 3 minutes to do and be PERFECT. Then again, Eileen and Marie would never do anything less. While you are there, check out when Stitchin Sisters will be in your area. I went to their event here in southern California and I learned so MUCH, met new friends and had FUN! They will be in northern California, Colorado, North Dakota and so many other places. Get to one of their events if you can and tell them I sent YOU. I love your ideas, in the past I bought hankies from Embroidery Blanks but find the postage now is too expensive to Australia. Perhaps you can find something closer to home. What you need is a (crochet preferably) lace that has openings to place the ribbon. The crochet allows for the lace to be heavy enough to hold everything in place. 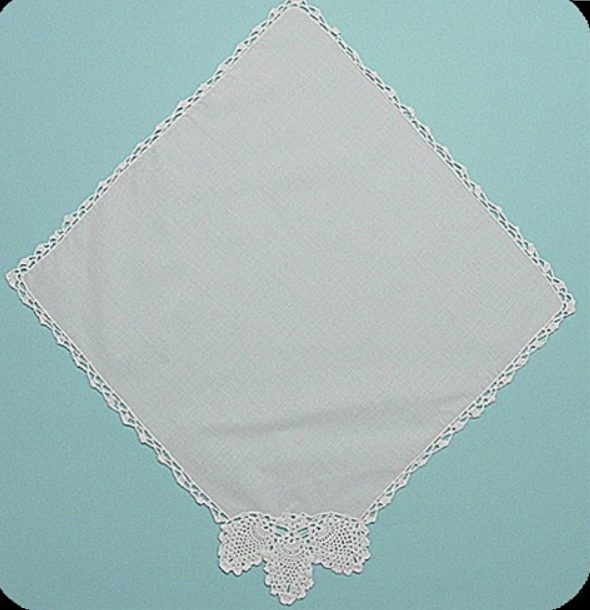 Perhaps an eyelet lace hankie is more workable and available. I know that the quality from AllAboutBlanks is truly dependable. Shipping has really become a very pricey commodity.